Flickr/David Almeida The former City of the Kings—once merely a stopover for travelers venturing south to Machu Picchu or the Nazca Lines—has recaptured a taste of its old splendor, but the new royalty rules from the kitchen, not the palace. Lima sits in a long and narrow stretch of tropical desert that hugs the Pacific coastline. The Andes are little more than 100 miles away, while sheer cliffs separate much of Lima from its rocky beaches below. The six-mile El Malecón stretches along the perch and entertains visitors with the Larcomar shopping center, Love Park and fiery sunsets that light up the Costa Verde (Green Coast) horizon. Less than a mile inland, Kennedy Park (as in President J.F.) is the center of action in Miraflores and an ideal reference point for Lima-based activities. South America’s third-largest country offers everything from sandboarding in Huacachina to piranha fishing in Iquitos, but the focus in Lima is eating, drinking and shopping in an urban landscape pulsating with fresh vigor. Athens has hit the news for all the wrong reasons lately. Economic crisis, social unrest and corruption in high places have become the blight of the city considered the Birthplace of Western Civilization. Some 2,500 years ago, classical ideals of democracy, philosophy and beauty were born here. Today it’s a chaotic jumble of high-rise concrete apartment blocks, dense traffic and soaring unemployment. But as Greeks look for a new way forward—they voted in the radical-left Syriza Party on an anti-austerity manifesto in January 2015—the city is still as exciting and exuberant as it has ever been … with tons of culture, a balmy Mediterranean climate and an unstoppable all-out nightlife. Flickr/Alessandro Baffa Nice has had quite a mixed upbringing, swinging between French and Italian ownership with an identity that’s just as undecided. While this coastal town on the French Riviera officially became part of France a little over 150 years ago, its residents still embody a mixed culture of Mediterranean, Italian, French and Corsican. Parisians may point their noses up at their southern sister, but the Niçois are proud of their city, called Nissa La Bella, or Nice the Beautiful, in the local Niçard dialect. The physical beauty is evident from the four-mile coastline running along the Promenade des Anglais to the eagle’s-nest medieval villages and turquoise-blue Mediterranean Sea, but the city itself is also developing and stepping out of the shadows of its nearby counterparts. Neighborhoods are changing for the better, adding new eateries and shops, bringing life back into a somewhat sleepy town, and showing that the city has just as much glamor as ever; it just doesn’t flash it as much as Monaco or Cannes. Flickr/Nick Kenrick The gateway to Canada’s west coast with a population of around 600,000, Vancouver sits at edge of the rainforest, is within a stone’s throw of some of the planet’s best skiing, and is one of the country’s most diverse bergs with more than half of its citizens speaking a first language other than English. Though it was named for British Royal Navy Captain George Vancouver, who mapped the region from 1791 to 1795, the city arguably owes more of its identity to Captain John “Gassy Jack” Deighton, who, seven decades later, opened a saloon at what is now the intersection of Water and Carrall. The tavern became the anchor for the Gastown district—Vancouver’s oldest neighboorhood and one of its chief cultural calling cards. The 2010 Winter Olympics brought Vancouver and British Columbia into the global spotlight. However, its fifteen minutes have continued thanks to an evolving food and cocktail scene, a vibrant arts community and its reputation as one of the most liveable cities in North America. Few experiences produce more dread in a New Yorker than a visit to Times Square, especially if it includes a stop at the stadium-sized Toys R Us with the 60-foot Ferris wheel. Sidewalk-spreading tourists and Batman meltdowns add to the pain, but the stress mostly stems from the steady stream of visiting friends who all want to see the Empire State building, Lady Liberty and every other attraction promoted in midtown hotel lobbies. Paste’s proposed weekend in Gotham has none of that. A real New York experience includes street murals, pop culture landmarks, emerging art scenes and culinary hotspots that never met a Groupon. The phrase “city that never sleeps” originally applied to the Bowery in lower Manhattan, not the city as a whole, and the neighboring Lower East Side (LES) rarely sleeps within a nine-block micro-hood affectionately called Hell Square. If these spots sound like an ideal home base for exploring NYC, this weekend layover is for you. Miami is a combination of grit and glamour. Here, on the southern tip of Florida’s Atlantic Coast, Scarface and Miami Vice gave birth to the Kardashians. Incorporated in 1896, after Henry Flagler brought his railway to the end of the peninsula, the city, which today has a population of around 420,000, made a name for itself in the 1930s with Art Deco architecture and a melting pot of cultures and cuisines from the influx of Cuban and Latin American immigrants. Nicknamed the “Magic City” during the real estate boom in the 1920s, the city is again growing at a rapid pace. In the past 15 years, neighborhoods that were once on the sketchier side (where you wouldn’t think of unlocking you car doors) have received a much-needed makeover and are now teeming with street art, new museums, artisan boutiques and local eateries. Flickr/Dejan Spasovski Belgrade has most of the trappings of an evolving magnet for hip travelers: a riverfront medieval fortress, historic shop-lined avenues, and former industrial zones that have become a lure for creative types. But the thing that makes the capital of Serbia, which started European Union accession talks in January 2014, special is that it brandishes a boastful and freewheeling energy while retaining (or as a result of) its enduring grit. Even after being destroyed and rebuilt some 40 times—after decades of sanctions, war and NATO bombings—the Balkan metropolis of 1.4 million entices visitors to partake in a new design district, barges repurposed as bars on the banks of the Danube and Sava rivers, café culture and partying long past zora, the Serbian word for dawn. Flickr/Mr. Nixter In 2015, close to 80,000 people flocked to Austin for South by Southwest, the city’s annual music and film festival. And there is no question the event permanently wins over a more than few hearts to the Texas capital each year. Proof positive: an estimated 110 new residents relocate to the Texas capital each day. But a visit here during SXSW is completely different from one during the rest of the year. While live music is a huge part of the city’s culture, Austin has also been making headlines for its cutting-edge food scene, and its temperate weather makes outdoor exploration a 12-month activity. Suzanne Cope The United Nations General Assembly recently voted 191 to 2 against the U.S. blockade of Cuba. This, combined with an ease of travel restrictions to Cuba in early 2015, further opens the door for Americans to enter a country that boasts beautiful colonial architecture, rich culture and people with a generous spirit. Havana was founded by the Spanish in the 16th century situated on a bay due east of Key West, and was named a UNESCO World Heritage Site in 1982. The largest city in the Caribbean is also Cuba’s capital and the vibrant city reflects the country’s history of colonization through architecture, food and art. Popular amongst tourists because of its walk-able neighborhoods, numerous museums and plenty of Old World charm, it is also a city in flux. Flickr/Thomas Hawk Despite what ABC’s "Nashville" would lead you to believe, Music City is not all cowboy boots and big hair. Sure, country music heritage is around every corner, but the city is also home to blues, rock and Americana artists such as members of the Black Keys and White Stripes leading man Jack White. Aside from the diverse music, you may be surprised to find that Nashville’s eclectic food and cocktail bar scene—one of the best in the South—ranges from rustic and charming in that American-flag-on-the-wall way to experimental takes on what Southern cuisine even means. Here’s how to spend two great days in Nashvegas. Luca Szalmas With a population of around 1.7 million, Budapest is not a very big city as far as capitals go. Split down the middle by the Danube River, the Hungarian capital is made up of what had historically been three cities: Buda, Pest and Óbuda. The layout is similar to Paris’ Arrondissements, with a ring of 23 districts spiraling out of the historic center. 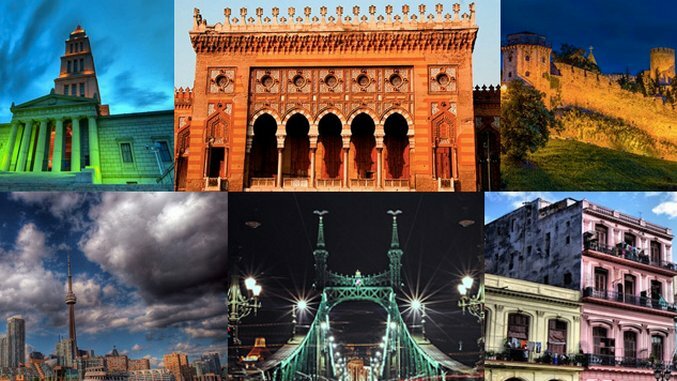 Budapest is an eclectic mix of personalities and each district has its own. In the I District, you’ll find cobblestone streets leading to the famous Buda Castle, as well as hidden medieval and Ottoman relics. The Old Jewish Quarter in the VII District is brightened up by street art on the once-empty firewalls between the famous ruin bars and hipster cafes. Most Hungarians speak English and the local currency will make you look like a millionaire as 1000 Hungarian Forints is worth around $4, and you might feel like one too since this is one of the cheapest capitals in Europe. Anna Callaghan Sarajevo, the capital of Bosnia and Herzegovina, is nestled in a narrow valley below the Dinaric Alps. The city, which was founded by the Ottoman Empire in the 15th century, is a charming mix of Western convenience and Balkan charm. Visitors come to feel the spirit of Old World Europe along narrow cobblestone streets, in cafes with traditional stove-cooked coffee, and to share a moment with locals over homemade liquors. What many tourists immediately notice is that this is a place of extremes. Barkeeps pour inexpensive drinks as the call to prayer sounds at nearby mosques. Girls in tight miniskirts clutch the hands of friends in headscarves. Those extremes mimic the tides of history. The city’s multi-dimensional charm is addictive. It gets under your skin. It captivates. Tourists leave only to return again. Shayne Benowitz Key West is an island of drifters, dreamers, free spirits and those simply drawn to the sea and the end of the road. The southernmost city in the Continental United States—and geographically closer to Cuba than it is to mainland Miami—Key West has always played to the beat of its own drum. Only eight square-miles with a melting pot of 25,000 residents, it’s an inclusive place with the motto, One Human Family, so come as you are. You’ll quickly realize it’s hard not to be lured by the salt breeze, the endless horizon and the laidback locals on this anything-goes, Bohemian island. Flickr/Brent Moore Chattanooga, Tenn., is dubbed the Scenic City. And for good reason. Straddling the transition of the Appalachian Range and the Cumberland Plateau, “the Noog” sits in the shadow of Lookout Mountain and is cleaved in two by the Tennessee River. With such an embarrassment of Mother Nature’s riches, it is perhaps no surprise that it has earned a reputation as a hub for outdoor activities. But, this quintessentially Southern city at the junction where U.S. Highways 24, 59 and 75 meet, and about two hours north of Atlanta, has more to offer than access to the great outddors. With a bustling downtown boasting shopping, a wide range of restaurants, a developed riverfront area, a vibrant arts district and the wonderland that is the massive Tennessee Aquarium, you could spend a weekend in just the city center. So do both. Immerse yourself in Chattanooga’s culture and then head off into its outskirts for some time spent amid the area’s striking scenery. Rob Gillespie Apartment blocks standing to attention in rows and utilitarian infrastructure are the battle scars of Seoul’s hasty development in the decades after the 1950-53 Korean War. But in this sprawling capital of 10 million, enclaves of intriguing architecture, green spaces, vibrant art and a flourishing international food and craft beer scene more than make up for the swathes of concrete. The city is split into two by the Han River. The older part—encompassing the central area and the main tourist attractions—is located north of the water, while Gangnam, where Korea’s one-percenters live, is south. Here, in this massive metropolis, lagging neighborhoods find themselves gentrifying at a pace as astounding as the high-tech country’s Wi-Fi speeds, and the city buzzes 24/7. Visit as soon as possible to glimpse a metropolis in a constant state of change—you’re sure to want to return to see how it develops. Flickr/Jon Worth Don’t be surprised if someone in Prishtina stops you on the street, asks where you’re from, and tries to invite you for a coffee. The capital of Kosovo is one of the most welcoming places in Europe, where a stranger is just a future acquaintance and hospitality is taken seriously. This spot has emerged from the destructive wars of the 1990s and become a bustling city teeming with trendy 20- and 30-somethings, cafes, clubs and restaurants. It’s still rugged; cars park on the sidewalks, construction is ubiquitous, and you’ll see the occasional carload of U.N. troops. But make no mistake, Prishtina is safe and welcoming. John's City Diner Visitors are coming to the Magic City in record numbers to explore award-winning restaurants, craft breweries, innovative art festivals, and renowned outdoor attractions. And this trend has every chance to continue as Birmingham was recently announced as the host of the 2021 World Games. You might say there’s a cultural renaissance underway and the city is eager to invite visitors to experience the new South. With an overabundance of Southern hospitality and charm, world-class cultural and sporting attractions, and historical importance to boot, the city is poised to entertain and surprise you. Flickr/Christopher Michel Hanoi is caught between two Vietnams: a pre-war village and a modern city rising from the ashes. Depending on the neighborhood, you’ll find old women dumping buckets of snails onto the sidewalk to cook or couples in colorful tracksuits doing calisthenics on manicured lawns. Packs of motorbikes zip around the skyscraper-laden center and into the winding streets of West Lake and the Old Quarter, where ancient buildings abut hip coffee shops and art galleries. Colorful apartments in French Provençal style shine through thick fog, creating a sense that a discovery might be behind any door. Narrow, winding streets give way to flea markets that sell clothes, spices and silver trinkets; and old men crouched over bowls of steaming hot soup on the sidewalk. A vibrant young crowd—most of Hanoi’s population was born after the American war in 1975—and bourgeoning art scene may have emerged, but a piece of Vietnam’s capital will always live in the past. Flickr/paul bica Today, this “City of Neighborhoods,” as it’s called, is home to a global citizenry, where over 140 languages and dialects are spoken on the 243 square miles of city streets. It’s the most populous city in Canada (over 5 million in the Greater Toronto Area) and often referred to as Hollywood North, because it is the filmic body double of many U.S. and European cities. It’s also a financial powerhouse, an academic hub thanks to the University of Toronto, and home to internationally recognized artists and writers including David Cronenberg and Margaret Atwood. There are still remnants of that British stiff upper lip—the city was dubbed “Toronto the Good” after all—but should you accidentally bump into a local on a crowded city street, chances are he or she will apologize to you … and then help you find your destination. A year at the helm of Paste Travel has taught me many things. Chief among them is the fact that covering stories for the Internet is different than the print world I grew up in as a young writer. Web stories have a different shelf life. In some ways these articles are fleeting and can appear or disappear with the click of the publish/un-publish button. The advantage, of course, is that those same articles might just exist forever … even without the need for shelves. Editors are also constantly looking for ways to attract Internet readers, or viewers, and keep them flipping through slides, pages, lists, images and galleries. A balance, therefore, must be found between eye candy and substance. For my part, I have tried to strike that balance—paying the rent, so to speak, with service-focused fun, and hoping that discerning travelers stick around the site to gnaw on the meat of longer, narrative-heavy pieces. However, Internet and print travel sections do share a common denominator: every magazine strives to give readers top-end destination stories, which provide the foundation upon which lists, galleries and essays are built. This “Best of” Destinations gallery is our version of that foundation—the weight-bearing pillar that supports all of our endeavors. One of the greatest qualities Paste Travel continually brings to the journalism world is that we play no favorites and have no geographic agenda. In 2015, reporters, freelancers and frequent contributors covered every continent with more than 500 stories. Some of our writers cut their teeth with Paste. Others are veterans, who can smell a travel article the moment they get off a bus, plane, boat or camel. We’ve been incredibly lucky to have such a wide range of destination-based pieces from such a talented group of journalists. We hope you feel the same way and that Paste Travel has inspired you to explore the world in 2015. We look forward to toasting you at some far-flung airport bar in 2016 as you continue your pursuit of knowledge and adventure. Alex Crevar is Paste’s travel editor.